We started the party with yesterday’s post. Warm summer breezes scented with all things good and green in the garden. Purrfect for a Cat Saturday Garden Party. 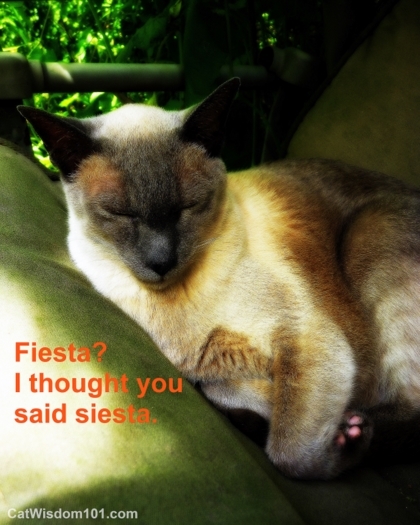 The only one not invited was foster girl Ling Ling. She’s strictly an indoor kitty but the good news is her quarantine is over and the doors opened. The bad news is she resumed her hissy mood towards the boys and when I noticed a tiny sliver of a claw imbedded in her velvet snout, she told me she’s rather be alone for now. Anyone who adopts her will have to receive her kissy-purry love-fest seal of approval. The doors are closed again and she’s playing queen bee in her ivory tower demanding to be hand fed baby food. She’s eating other food and has bounced back from a URI but I’m happy to indulge the princess. It’s part of her “love” therapy to ease her stress. I’m gradually working to help her adjust to living peaceably with other cats, but she’s clearly an affectionate one-person cat, as many Siamese are. Ling Ling has simple tastes in toys and likes playing old-fashioned “catch the ribbon snake.” Every cat teaches us what they want and need, if we listen and not try to impart our desires on them. So, after exhausting games of Kamekaze ambush, butterfly and grasshopper hunting, hide-and go-seek in the bushes, find the groundhog’s hole; today we’re being more civilized for our garden party and Merlin is playing host. You can play if you want to but it’s hot, and doesn’t a nice open air nap sound good? Merlin is getting old but don’t call him a senior. You’re welcome to share his favorite swing in the secret garden. Or perhaps you’d prefer a little bubbly served on the wrap-around porch by the debonair Gris Gris. He’s come a long way from being a nervous, un-socialized, basement mouser. Never mind their blase attitude; we’re so glad you could make it to the party. It’s important to communicate to your cat why you’re leaving and when you’ll be back. I like to communicate to cats that they’re still loved and it’s a temporary situation. Their guardians will return. Cats don’t have the same sense of time i.e. 5:25 PM or seven days. I convey the length of time with visual pictures of day and night. ooooh, a pawty! Thank you for the invite! We’ll be happy to remove any bugs and lizards from the premises. The imagery is very interesting; and I think it works for negative as well as positive feelings–how many time do our pets disappear when we’re upset, or come to comfort us? They certainly do know. Great party. Thanks for asking us. 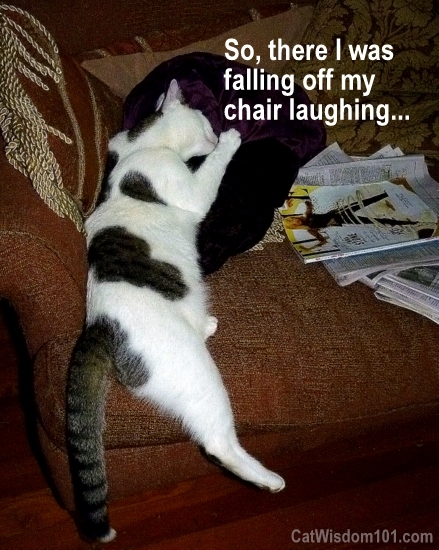 Love Odin laughing so hard he is falling off the chair. 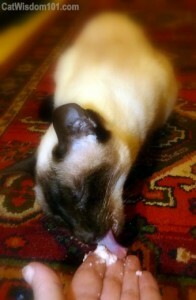 LingLing, lots of cats do NOT like other cat company. I really think some cats just like to live alone. Penn, you sure are a pretty cat. The kitties are very lucky, since I do not go away since I don’t have anyone that would look after this mob. But good advice. Marg, all your gang is super lucky having you! Thanks for the catvite to the garden party! We had a delightful time meandering through the garden with all the kitties and now feel deliciously ready to begin some serious afternoon napping. 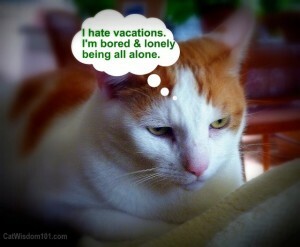 We also appreciate your advice on what to do when your human(s) go out of town on vacation. Our parents make absolutely certain that someone comes by several times a day for some feeding, litter scooping, and human contact bonding. It is very upsetting to the balance of a cat to have things out of sorts, so this was purr-fect advice. 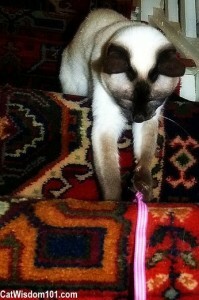 Deb, always a pleasure.. Big purrs to ZZMPRJH! I love that you are cat sitting for Penn. 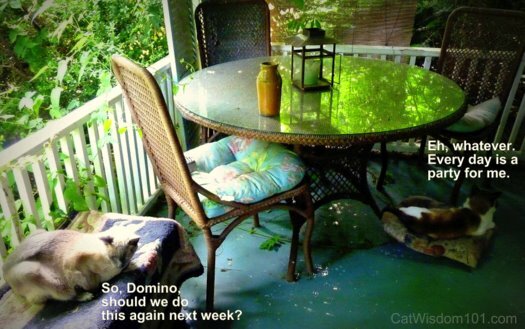 We are going on vacation in September and it will be the longest we’ve ever been away from the cats we have now. A friend said she’d feed them twice a day but I am very worried about Tigger who can go into not eating over emotional stuff and be heading for fatty liver disease in less than 12 hours. Last time I force fed him and got him eating again but I am worried. He doesn’t do well when I am gone. Sorry for going on and on but I just love my kitties but the family needs to get away for our first vacation ever and I can’t bring the cat. Faith, you’re right to be concerned about Tigger given his history. It’s important to tell him what’s happening and for the cat sitter to do the same. A good time would be when you take out luggage and start packing and even play give treat while packing to have him associate luggage in a positive light. When you’re communicating stay very calm, focused and loving. You don’t want to project any fear or anxiety. Prep in advance with his favorite treats and maybe baby food which has a high water content for extra hydration. Try homeopathic Rescue Remedy or Stress Stopper in the drinking water a week in advance. He already knows something is up so tell him and enjoy your vacation. Remember you can communicate with him and send him love while you’re gone. I’ll be writing about doing that soon. What a lovely garden party. Do I have to bring Ichiro home? We would rather not–really! No, Ichiro can have a sleep-over and yes, it’s always a good idea to have pet sitting get acquainted in advance. Sounds like a sweet arrangement of bartering. Party time! Woohoo! Allegra and Ruby are putting their party hats on! Wonderful photos, as always. 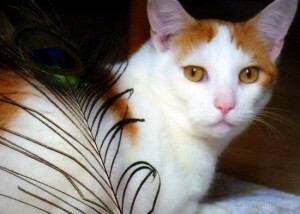 The one with the peacock feather should be in a calendar. 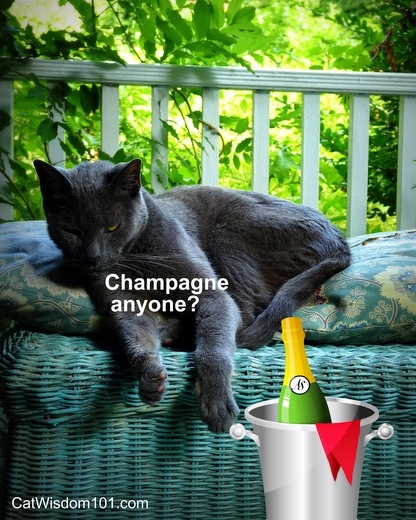 But my favorite is the one of Gris Gris and the champagne bucket. The transformation in him is just absolutely amazing. And Ling Ling is already showing the same shift in her newer photos. You do work magic with these cats. I’m a champagne person myself, so I’m with Merlin 🙂 Good advice and I hope Ling Ling finds the perfect forever home ! Penn is so cute. We’re leaving for Montreal for 5 days and John’s sister will come in. What kind of baby food does Ling Ling like? Our boys favor Gerber Beef, but Ham is second and Turkey’s a love, too. So nice to see your house full of kitties! Ours are sleeping now, being 10 a.m. Enjoy Montreal. Ling Ling likes turkey or chicken. Did you know ham is hard for cats to digest? 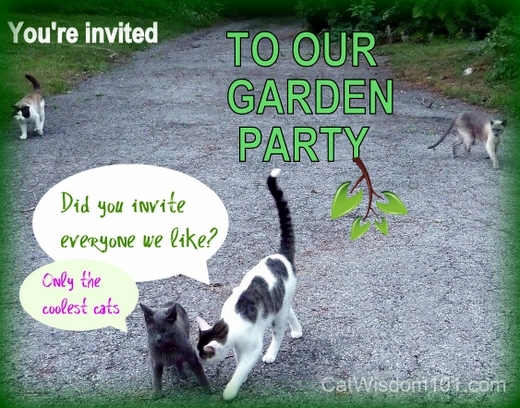 That was sure a great garden pawty and I loved the ending wisdom the best!!! Thanks for coming Brian, you clever boy. The last photo is simply gorgeous, (they all are but the last one is a particular favorite) Penn’s coloring is exquisite. You definitely have the “magic touch” with your babies, you have worked wonders with them all. Thanks Caren. 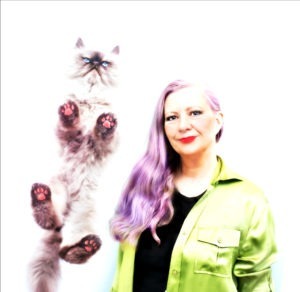 Cats are my passion and creative muse. 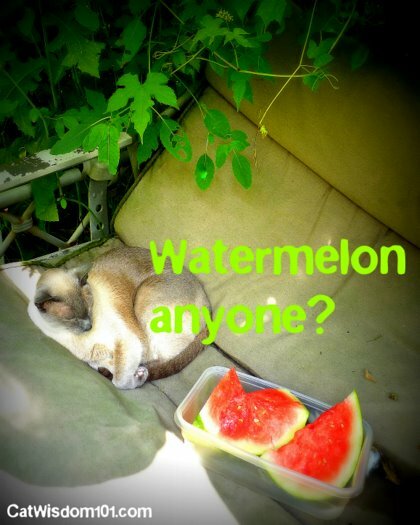 What a nice garden party you and your kitty krew have been hosting Layla! Sam enjoyed looking at the pictures of your beautiful yard and all the treats you provided for your guests. Sam’s suffering from “greenery” withdrawal since it’s been so dry here so it was nice to at least get a visual bit of cool breeze with your photos. Penn is a beautiful cat and I’m sure he misses his family but you are giving him a wonderful and stress-free temporary home and he looks happy. Thanks again for the invite to the par-tay……Sam said he enjoyed it immensely. Pam, so glad you and Sam could come and enjoy some greenery.